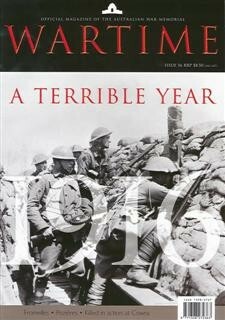 1916 A terrible year by Peter Burness. When Australian divisions finally joined the British army on the Western Front they met a new form of fighting and suffered a year of horrific sacrifice. Disaster at Fromelles by Ross McMullin. Fighting reason by Michael Gladwin. Faced with the ugly reality of trench warfare, few soldiers on the Western Front held onto their political ideals or their notions of Empire. They found other reasons to go on. The Legerwood memorial carvings by Robert Jones. Trees originally planted in remembrace are now carvings celebrating soldiers of the Great War. The 'Black ANZAC' raid by Michael Molkentin. The AIF's first trench raid on the Western Front highlighted the need for meticulous planning. Easter rising by Jeff Kildea. Australians on leave were caught up in the Irish revolt in Dublin in 1916. Ruling Britannia's waves by Peter Nunan. The diary of Signalman Edward Beaton, who served on the cruiser HMAS Melbourne, shows that the experience of war in 1916 was not confined to the Western Front. More than just a comic strip by Peter Stanley. A master of slang created an authentic piece of Australiana. My dad by Margaret Gurney. The man behind Bluey and Curley. Killed in action at Cowra by Graham Apthorpe. Could Private Charles Sheperd’s death during the Cowra breakout have been the result of “friendly fire”? ‘Dear Soldier’ by Kerry Neale. The words of students from Gowrie Park State School still hold memories for Vietnam veterans. ‘Hello Stan Hill’ by Walter Kudrycz. Who was it that held up a welcoming sign for Stan Hill following his liberation from Changi prison? Seeing is believing? by Shaune Lakin. Well, maybe not always. Manipulation means that some photographs are not really as they appear. An acclaimed painting of an Australian commando captures a courageous leader’s martial prowess. Hallowed grounds by Albert Palazzo. Two cemeteries in Crete attract pilgrims seeking comfort from the wounds of war. Climbing Sunnyside koppie by Craig Wilcox. A tour group to Australian battlefields of the Boer war recently walked the site of the important but little-known fight at Sunnyside. Eyewitness by Peter D. Williams and Naoko Nakagaw. Four Japanese officers discuss their part in the war in New Guinea.